Have you ever been so powerful that you never use your full strength at any cost? To be honest, I was searching for a new element but since most were used, I went for something that looked more like the Rahkshi powers, but classified as element. 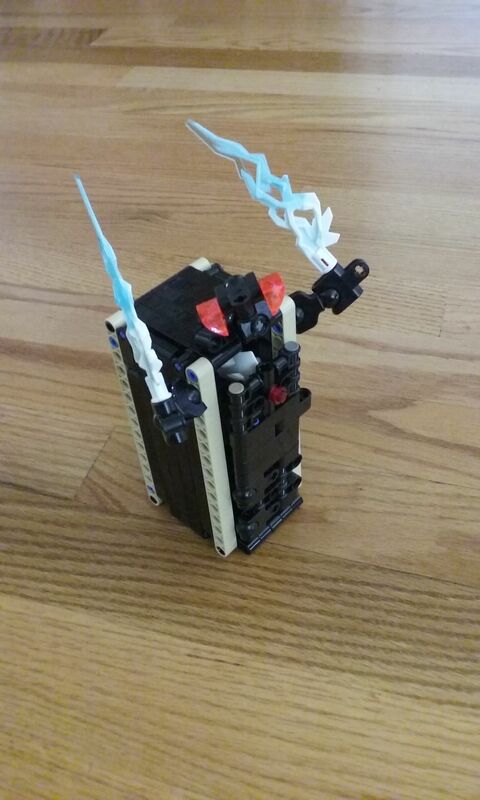 As I posted my MOC for the first time, I wrote down that he was a Toa of Lightning. Then a TTV user told me, that his colour sheme fits more of a Toa of decay and poison instead. When thinking about it, I saw a great potential in this new form of element. 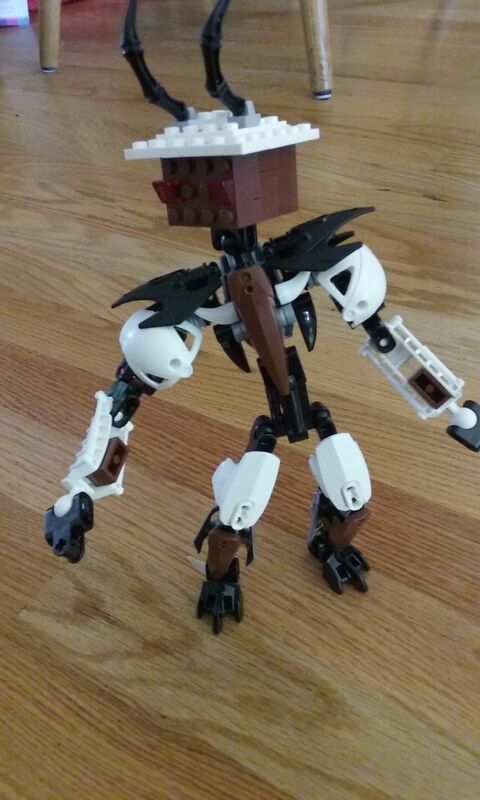 Tilar is the only Matoran/Toa of Decay in existence. Reason? He is a prototype and experiment of the Great Beings. Fearing that he could be a potential threat to the very existence of the MU population, they only produced one, Tilar. Touching someone can poison the touched being and even make him rust, until dying decomposed. @RaptorTalon , you already know in my story. But I CHALLENGE YOU TO try to list the top 5. GOOOOO!!!! One is Gyraze. Gyraze is a robot pretty much built to destroy everything. While I haven't finalized his weapons yet, I'm working out some sort of powerful arsenal. He especially packs a punch from a distance, probably with some combination of Cordak blasters, Nynrah ghost blasters, concussive force blasters, and good ol'-fashioned lasers. He's formidable up close too, have a flamethrower, electricity-dispenser-thingy (is there a name for this? ), and a pair of swords. Assuming anyone manages to get past any of this, Gyraze is built to be able to withstand a bombardment from himself. Even Toa of Magnetism or Gravity are going to find themselves struggling, as Gyraze's most impressive feature is his "Kabrua Core," which neutralizes all Toa powers within a respectable radius. As of yet, he has no weaknesses, which is something I should fix. While Gyraze is a sci-fi monstrosity, my other creation errs more towards the fantastical side. Protinoc is... a thing. Fear incarnate, or something like that. His backstory isn't as fleshed out as I would like. Protinoc boasts all 42 Rahkshi powers, which is powerful enough. His most potent ability is the ability to completely absorb those that are consumed by fear. 'Don't Panic,' because when you do, you basically don't exist anymore. He doesn't have any specific weaknesses either, although he would probably lose to Gyraze, Gyraze lacking actual emotions to influence. After hearing in the Recap Review of Stars Tahu, find out he might have all the powers of the Rahkshi, I would say Tahu in very OP. This place gives me SMARP flashbacks, there were more op characters than there was plot development. My most powerful creation is a tie between a living muffin, and an evil refrigerator. tie between a living muffin, and an evil refrigerator. @Rockho. But the Refigerator does have a way. It's called... buying furniture. And that is how the robots plan on taking over the world. Since I'm only now fleshing out the Toa Team that I created eight years ago (never made MOCs of all of 'em, unfortunately), my current strongest characters are Jalon (my Self-MOC) and Artuhrenn (my brother's Self-MOC). 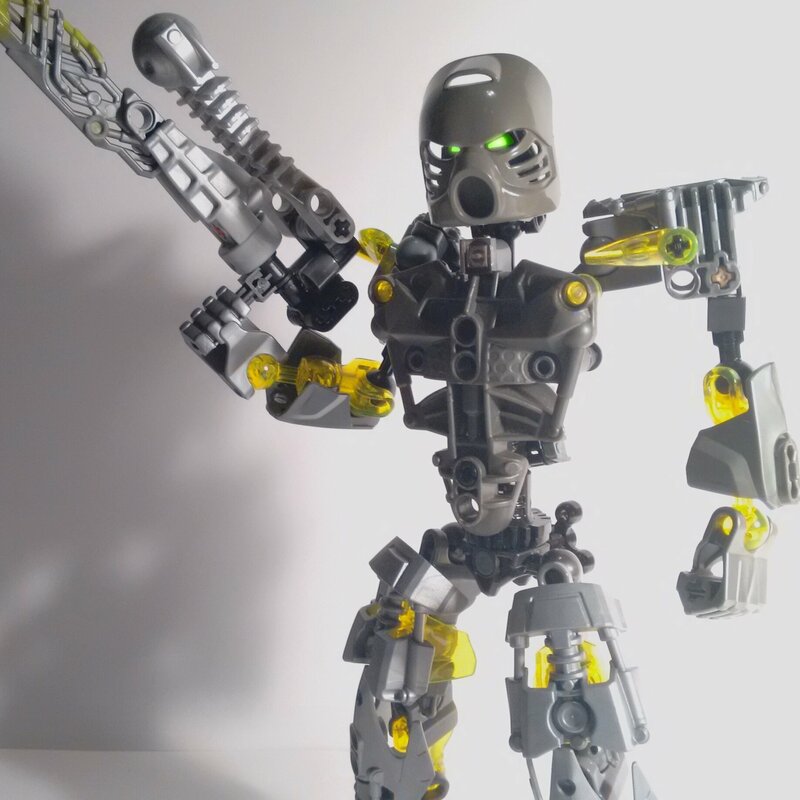 Jalon is the Toa of Time, with his masks including a Kualsi, a Matatu and the power of the Vahi. This gives him the ultimate repitoire of abilities: telekinesis (letting him move not only objects, but individual atoms, giving him the ability to create things made of plasma), quick-travel (self-explanatory), and control over time itself. Though he mainly uses his Vahi to slow down his perception of time around him, he can use it in conjunction with his other masks to fight in a precise, combo heavy and deadly style. He can also use it like a sort of Witch-Time which, if you've ever played Bayonetta or seen her in Smash Bros, triggers a counter after being attacked that slows down time for her opponents, allowing Bayonetta to set up epic combos. Besides this, Jalon can also time-travel, which comes in handy when observing the Great Beings and figuring out their next moves. In comparison, Artuhrenn is the Toa of Space, with his mask being an Akaku. His spatial powers allow him to teleport, jump dimensions, make holes in the time-space continuum, and more or less tamper with the fabric of the multiverse, which is something Jalon tries to avoid if at all possible. You can see why the two brothers don't get along. @Rockho. Refigerators will be mass produced, and sold at stores. They will then conquer the world. 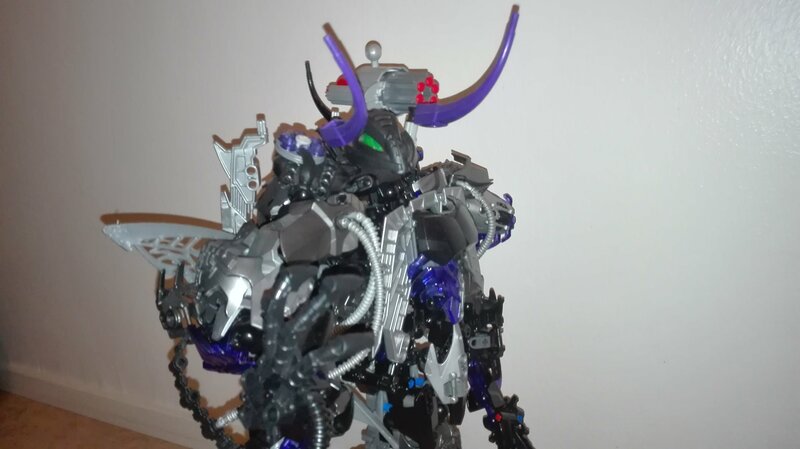 He is a Nu OC created by an angsty teen matoran, that was brought to life by some spooki Makuta shadow power, or something. His Razor Edge is so sharp, he can cut stuff on contact (Including memories, electricity and gravity). He is the master of the Edgeforce (And has mastery of all associated powers, Edge Portals, Edge Projection, access to an Edgemension, etc). His Edgemension is filled with all kinds of crazy stuff. He has a real popular Tumblr blog. Triggering him grants him absolutely riducolous amounts of power. No matter where he might end up, he plays by the rules of the Terryverse. Ah, good. Not Breaking Benjamin, because they are actually good. Here's my most OP character. (Sorry for the bad pic, it's a screenshot from an old video) He's a member of Brutaka's species, which already makes him really strong. On top of that, he wears the Mask of Adrenaline (a poorly modified Tarduk mask), which makes him get stronger and faster the longer he fights. Imagine the Hulk as a biomechanical warrior. So, I redid my story for Ailan, and made him even more powerful. And that's not even counting the mask he wears on his face, usually a Mask of Illusion. And of course, being a Toa of Air, he can control air. He doesn't usually carry a weapon (not like he needs one anyway, with all those powers) but he has been seen to wield a Hagah Plasma Cannon. Geez, I look through this topic, I drown in the sheer op. None of my characters have ever been particularly op in theory, it's more so just having good combinations of powers, like my self-moc, a toa of plasma wearing a kakama, not inherently op, but being able to superheat your weapons and move at incredible speed can get stupid real fast. I've made stands for some of my characters, but they're non canon, I generally don't enjoy stupidly op characters so I don't create them, I also don't usually get super into story stuff anyways.